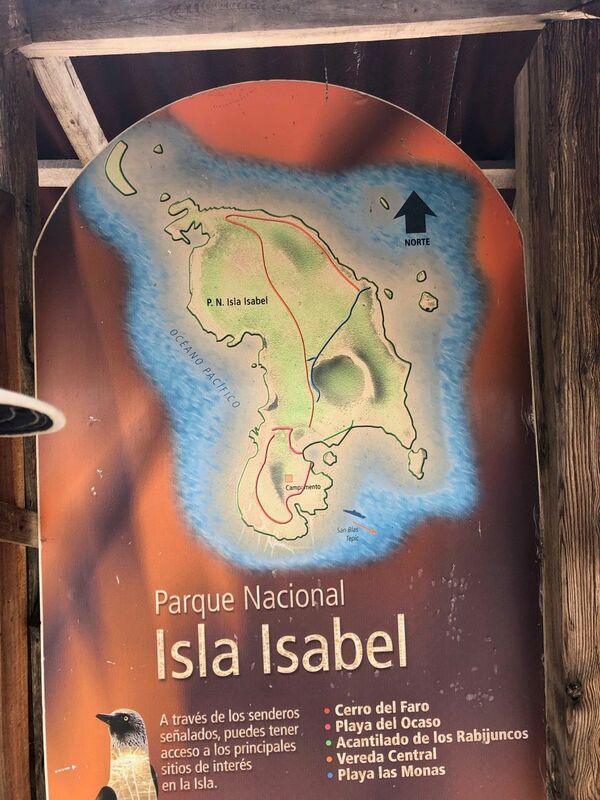 Isla Isabel (also called Isla Isabela) is a small volcanic island, a little over a mile square, and about 45 miles from the nearest port. 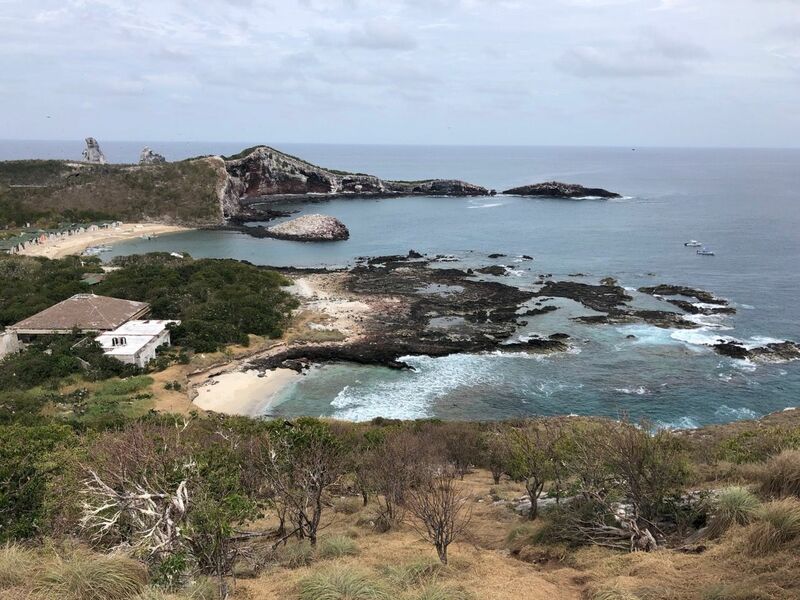 Often called the Galapagos of Mexico, and famous for the documentary that Jacques Cousteau made here, this little island is a National Park and a UNESCO World Heritage Site. Other than a small row of fishermen's shacks and a small scientific campsite, the island is uninhabited by humans. 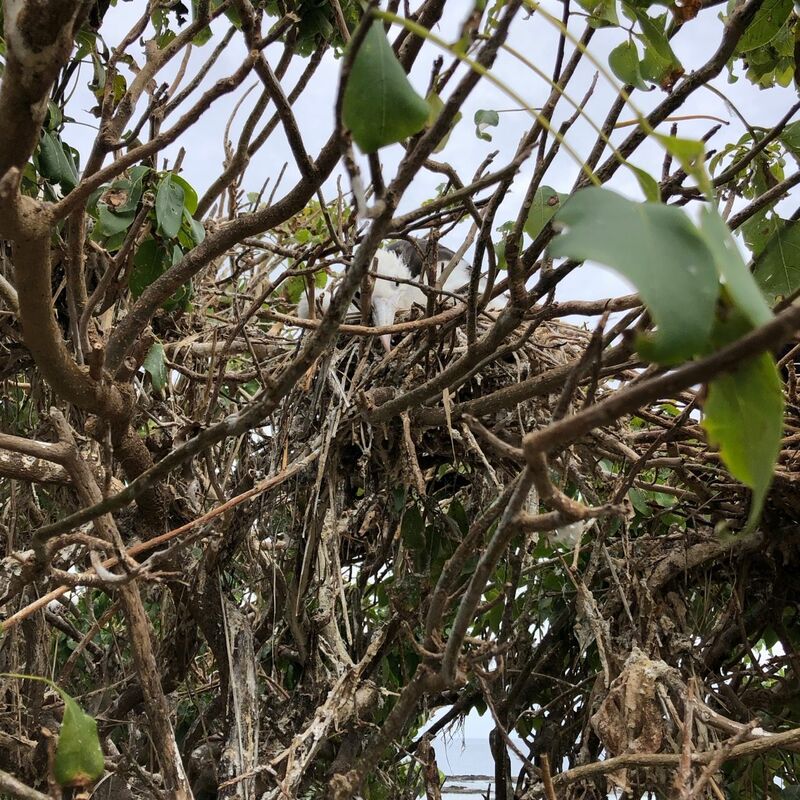 It is heavily inhabited by birds, who have no natural predators here, and therefore do not startle easily. 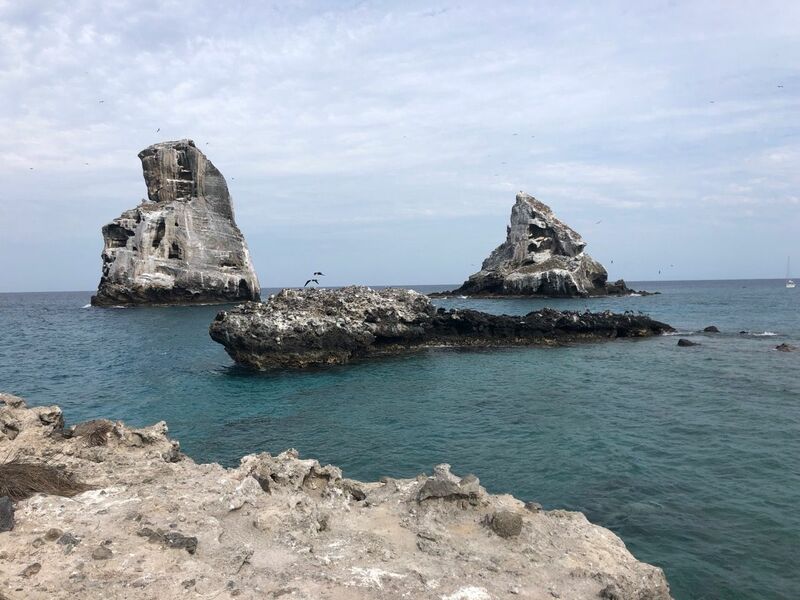 You can walk among the thousands of nesting Magnificent Frigatebirds and Blue Boobies (No, I'm not making those names up!) like any other animal. Doing so was one of the most beautiful experiences I've had. View from the hill we hiked on day 1. That roof is... just a roof. Underneath is a broken concrete platform where some folks on a dive trip were pitching tents. 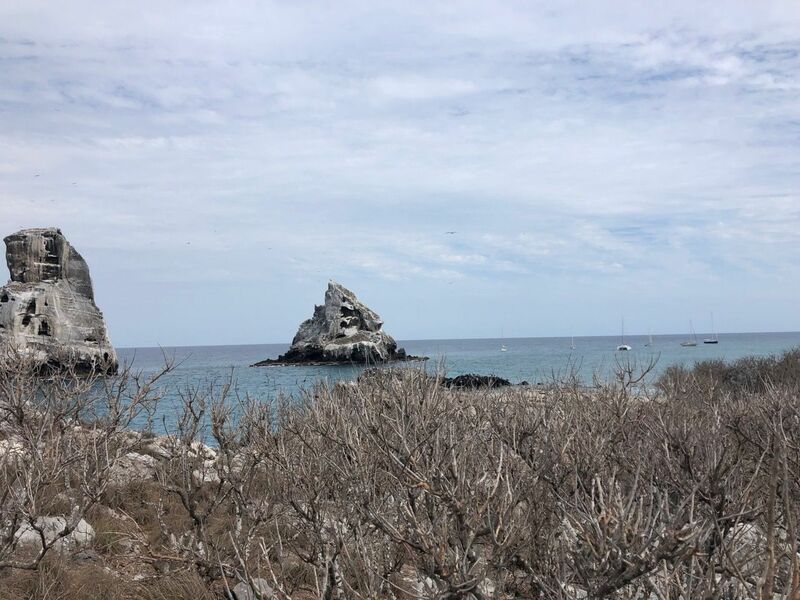 Being volcanic, Isabel is rocky and hard to anchor at; it's said more anchors are lost here than anywhere in the Gulf of California / Sea of Cortez. Best practice is to run a trip line, a second anchor line with a float that marks your anchor, so that you have another angle to pull from if your anchor won't come out of the rocks. (Note on anchoring at the end for cruisers.) There's very little protection from wind or waves, and... well, usually boats anchor on shorelines. This is really almost anchoring in the open sea. Some folks consider it day trip only and won't spend the night; many do not attempt to anchor here. 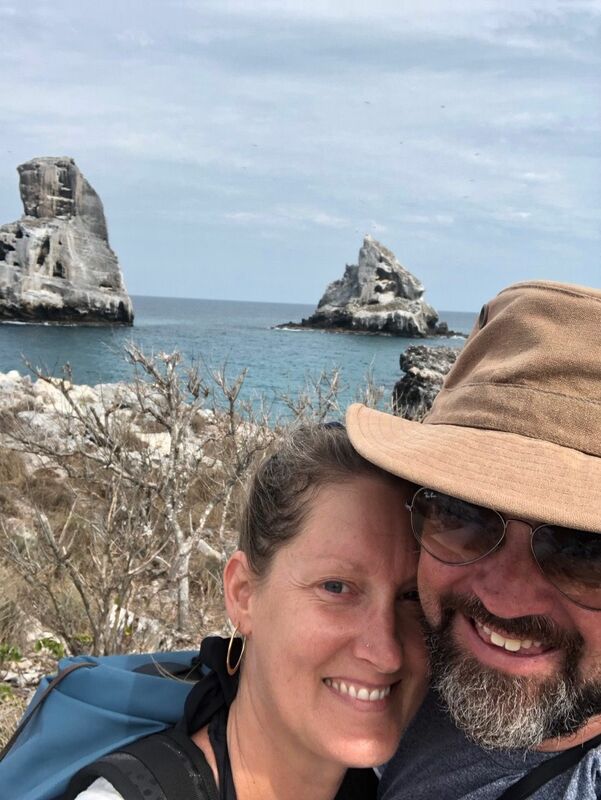 It's a definitely a fair-weather-only destination, and as we headed south from Mazatlán, it was absolutely vital to my beloved that we go here. James, you see, has developed a passion for birds. 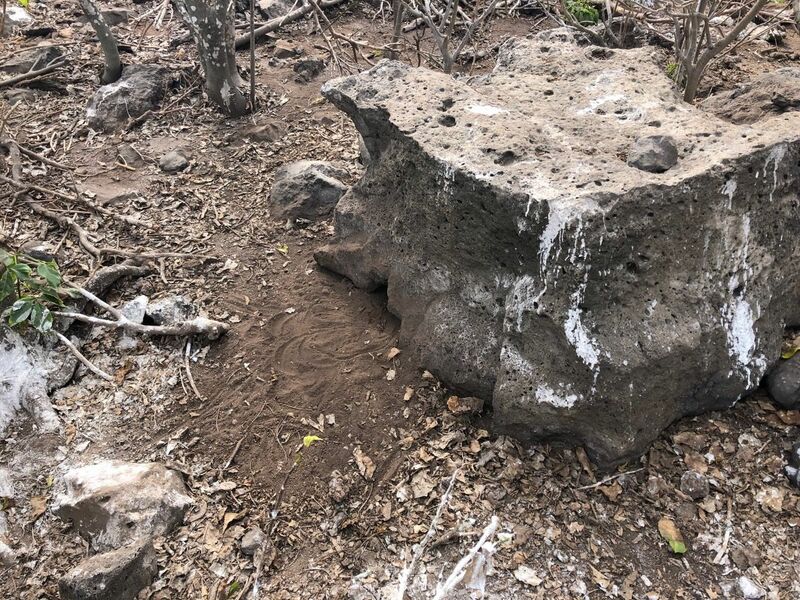 This post is in chronological order except for this clip, which is from the rocks facing Las Moñas on our second hike. But it gives you a sense of things. We planned to leave Mazatlán for three days running. On the first, the sea conditions for anchoring our first night at Isabel looked a little too strong (when we look at "weather", we look not just at the atmospheric aspects common to land folks, but at the sea state; there are forecasts for the size, frequency, and direction of the waves, too!) On the second day, there was a red flag up on the channel, meaning that the wind was strong and kicking up waves which led the Port Captain to declare the channel unsafe for departure. We used the extra day to visit El Faro, the beautiful lighthouse we had not yet made it to. Finally, on the third day, we were able to leave. We headed out in the afternoon for a glorious overnight trip; the full moon was up almost all the hours the sun was down. It was a great journey; a sweet sail until the wind died around midnight, and then an easy motor. Our first solo overnight! We had crew for overnights on the way to Mexico, and a buddy boat when we crossed the Gulf a few months ago. We now know that overnight sails, which terrified me at first, are a favorite of ours. 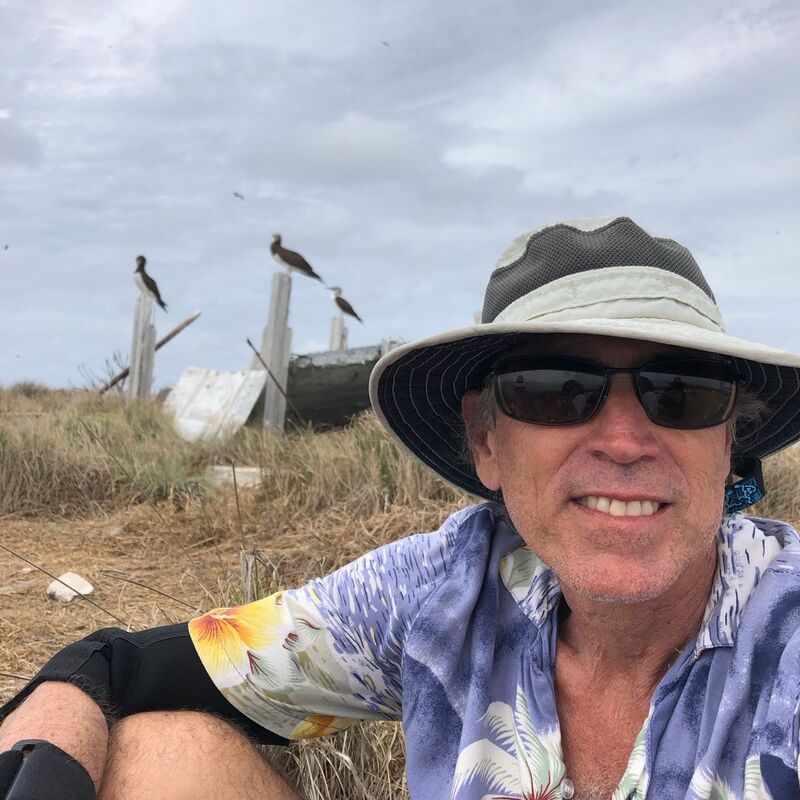 We landed at Isabel a bit after dawn, happy and tired, anchoring just behind our dear friends Bruce and Alene of SV Migration; they'd come down from the other side of the Gulf and we were meeting here to play before they head off on the Pacific Puddle Jump. We inflated our dinghy, picked up our friends, and headed in to the island for a first hike. 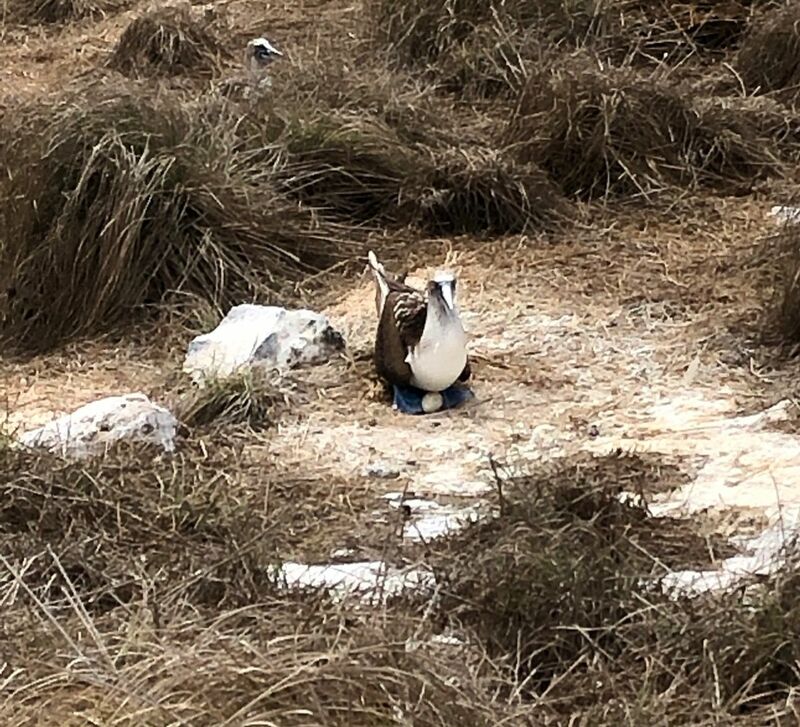 There were frigates nesting all over as soon as we landed, and we hiked up a hill where the boobies were showing off for each other. Bruce, James, and Alene. Oh, how we love these two! Been hanging out for almost year and a half, leapfrogging from the San Francisco Bay to Banderas Bay as Migration completed a 12 year slow circuit of the Pacific and began again. Alene and Bruce are good friends and generous mentors. We've learned so much from them and had great fun in their company. 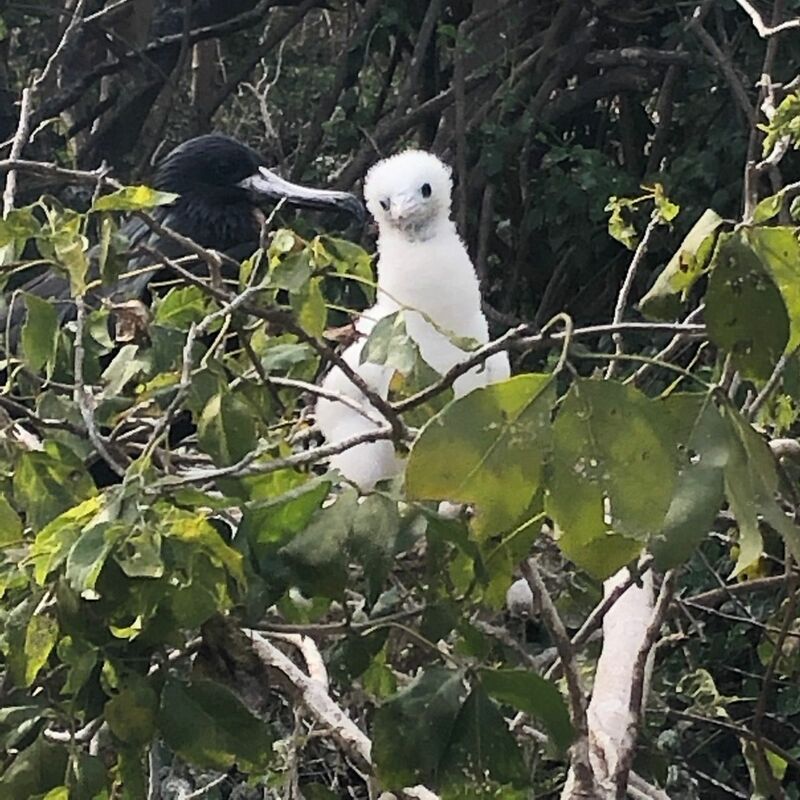 This baby frigatebird was just as curious about me as I was about them! This is shot with my iPhone; the nest was just above my head as I walked under the tree. No special lens. The birds are just right here, living their bird lives. You are a visitor in their world here. When you hear that a mother bird "regurgitates" for the baby... I didn't imagine it like this. The baby, here almost as large as their mother, stuffs their entire head – with long, hooked beak – down the mother's throat! This video is not very graphic, as I was holding up my phone off to the side of my face and watching events with my own eyes; my phone wiggled at the grossest moment, so it's out of the frame. You can see most but not too much in this video, and the full OH MY GOSH WHAT? in the next one. Oh yeah. This is some serious National Geographic stuff. The internet says that this flapping is a cooling mechanism. 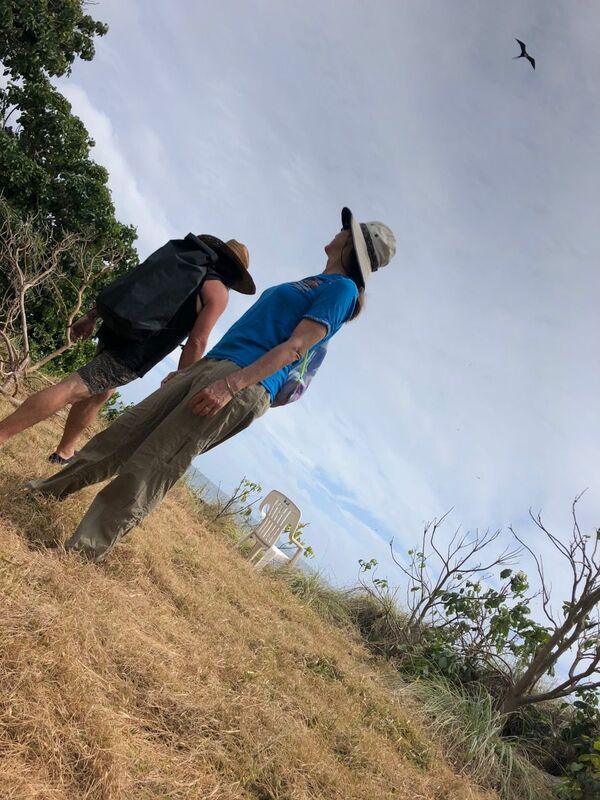 Then we hiked up to the top of the hill to see the Blue Boobies, which are astonishingly charming. We all just sat down for an hour or so and gawked. 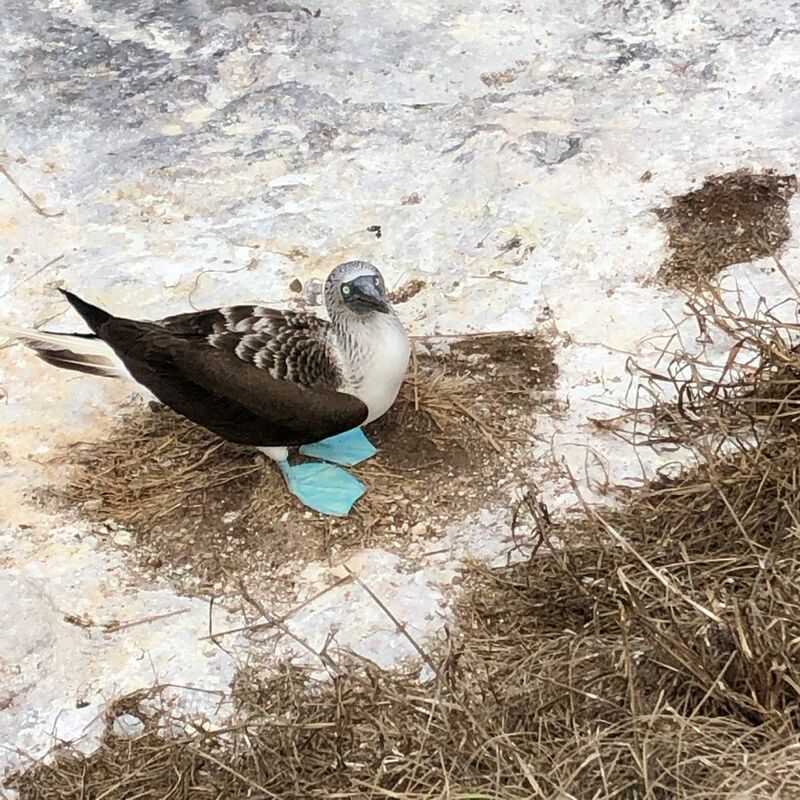 This booby stood up to cool her egg and shake out for a minute or two and we were thrilled to see her egg! That night, Migration had us over for dinner. We'd spotted another boat we knew pulling into the anchorage that afternoon; Kelly and Dave on SV Arctos, who we'd been in Morro Bay, California and La Paz, Mexico. 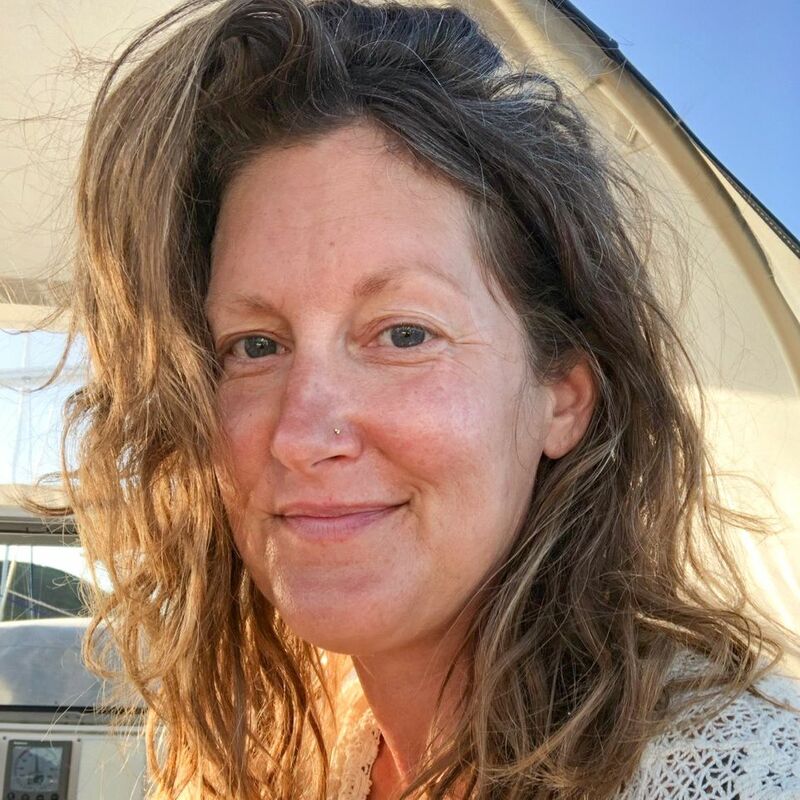 Kelly and I had first met online, and she'd kindly offered some advice about port entrances when they were a few ports ahead of us. They're amazing folks; she's a pilot and he's a nurse and paramedic. If you get injured in Alaska and need to be medevaced, Dave would keep you alive while Kelly flew you to Seattle. Super chill and super capable people, and devoted surfers. Migration had us all over for dinner, and when we woke in the morning, Alene and Bruce were gone, off to Banderas Bay for final preparations for the Puddle Jump. We spent a day at anchor, catching up on sleep after the night passage, doing some boat care, and chilling out. A whole bunch of boats had moved around the corner from the south, rollier anchorage to the east, smoother one we were in, and it turned out that we knew Eric and Morgan on SV Zephyr from the Baja Ha-Ha, Mike and Katie on SV Allegria were our across-the-dock neighbors at Marina Bay Yacht Harbor before we left San Francisco, and there were two more surfer boats who were buddying with Arctos. Zephyr is a huge catamaran, and they kindly had us all over for a potluck that night, with a centerpiece of grilled fish caught with a speargun that day. Most of the folks on boats out here cruising are retired, and it was fun to hang out with a group of people where we were the oldest instead of the youngest! On our third day, we got up and drove the dinghy around the corner to land and go for a big hike. First we ate lunch in this tiny cove, where we had the whole beach to ourselves and the breaking waves were an incredible blue. Isla Isabel is a volcanic island. There are nine craters. The largest one forms a lake. 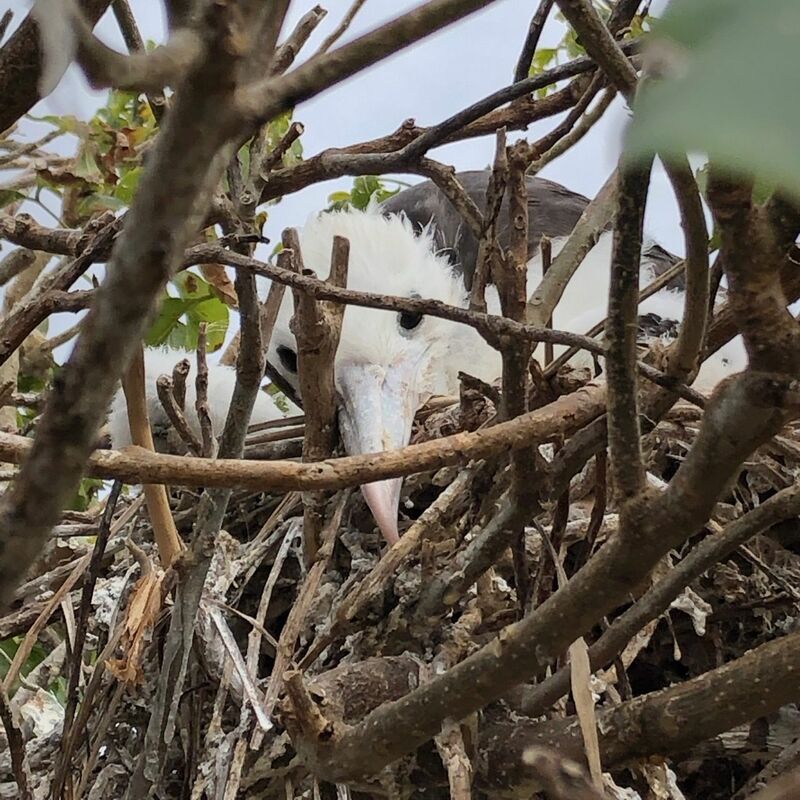 The juvenile frigatebirds appear to use this for practice; there were many, many young frigatebirds soaring in the wind currents around the lake. We only saw them come out over the open sea one unusually calm afternoon. So the lake is flight school, we think. 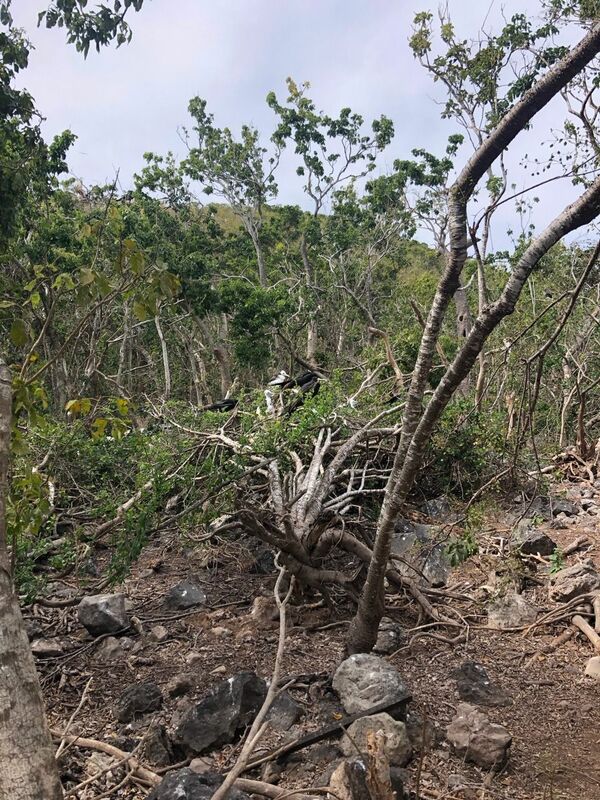 A hurricane did great damage to the island a few years ago. 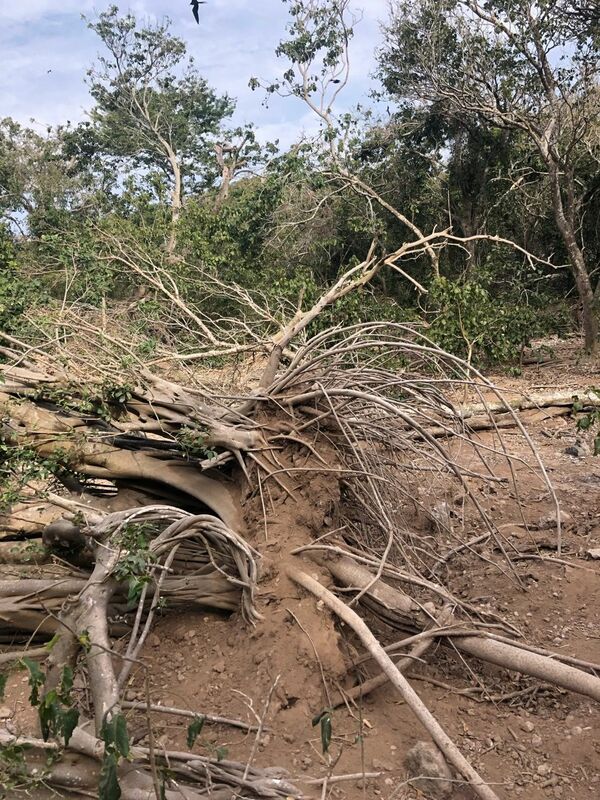 There were many downed trees, and Bruce and Alene said the booby population seemed to be about a third of the size of their last visit a dozen years ago. The male frigates have a red gular sac which says HEY BABY. It is highly effective, visible through the trees at very long distances. 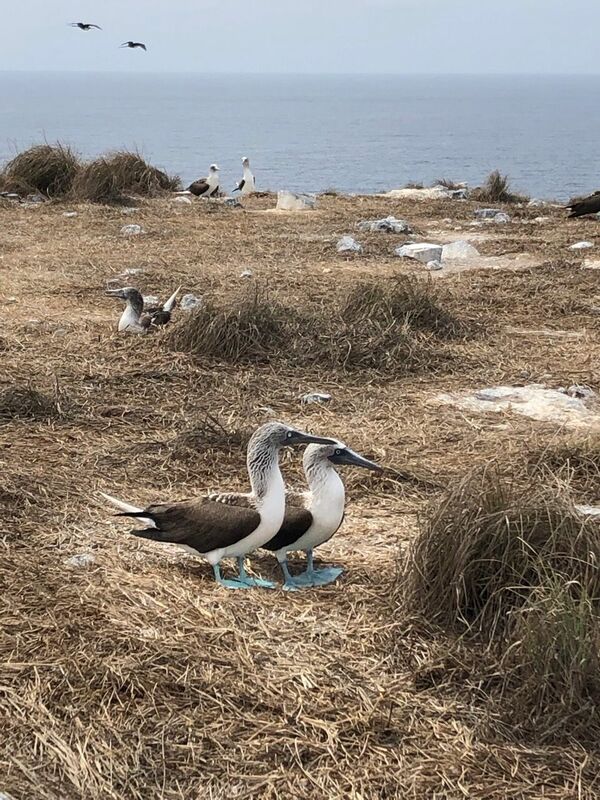 While the frigatebirds were feeding their young, the boobies were just mating, making nests, or sitting on their eggs. These two charmers are building a nest together, discussing each twig one at a time. We hiked all the way across the island to the beach that faced our boat. There is Rejoice at anchor! The two big rocks are called Las Moñas; a moña is a dressmaker's mannequin. ALL THAT WHITE IS GUANO! As we stood on the rocky crags facing the sea, we saw a pair of humpback whales, mother and baby. The baby was in such glee, just breaching over and over and over. 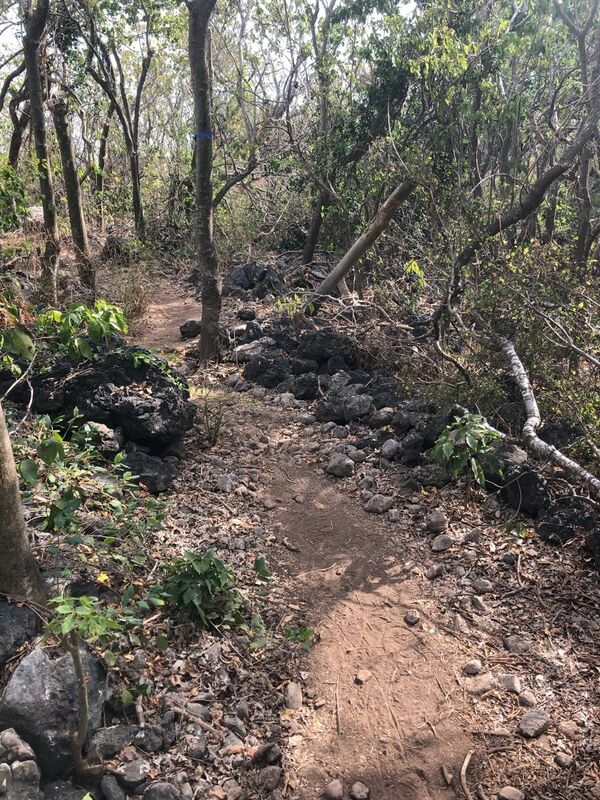 Left: We were awed with gratitude for the people who cleared all the volcanic rocks, surely done by hand, to make the paths we walked. 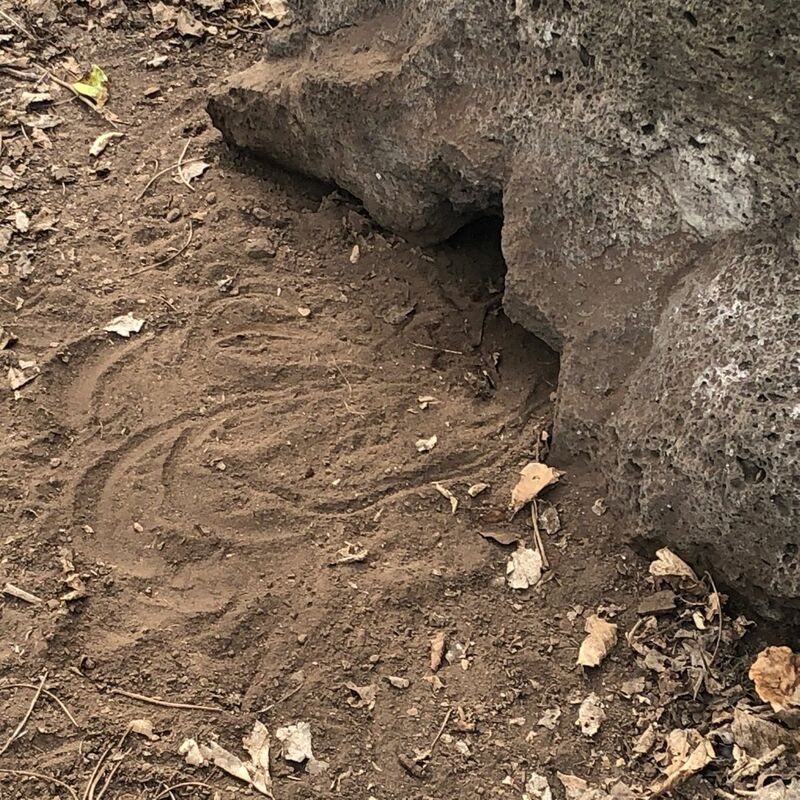 Right: the nests in the trees are... not hard to spot. 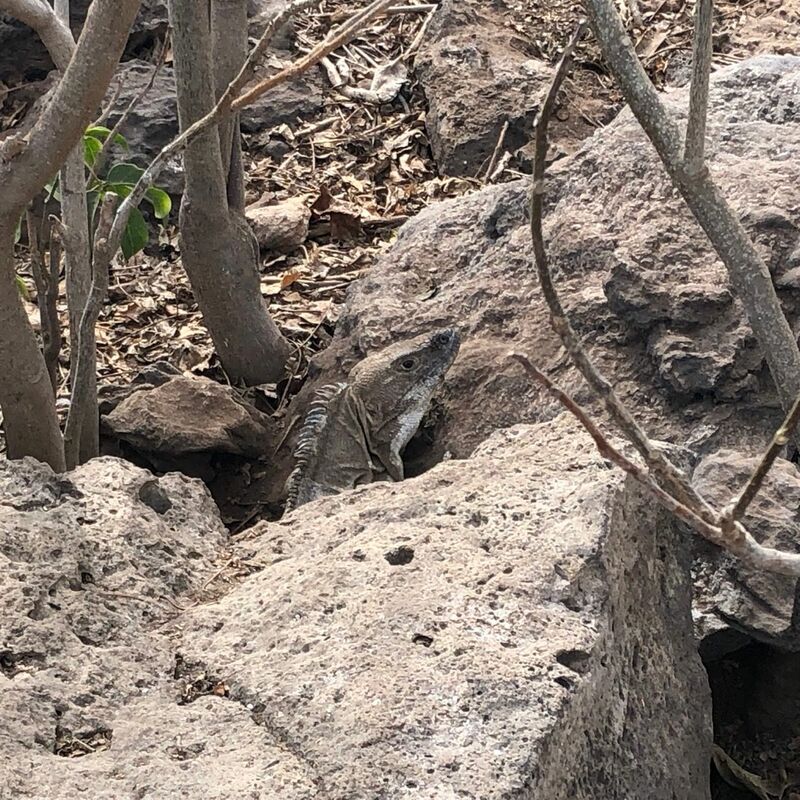 There are many iguanas and lizards in addition to the birds! 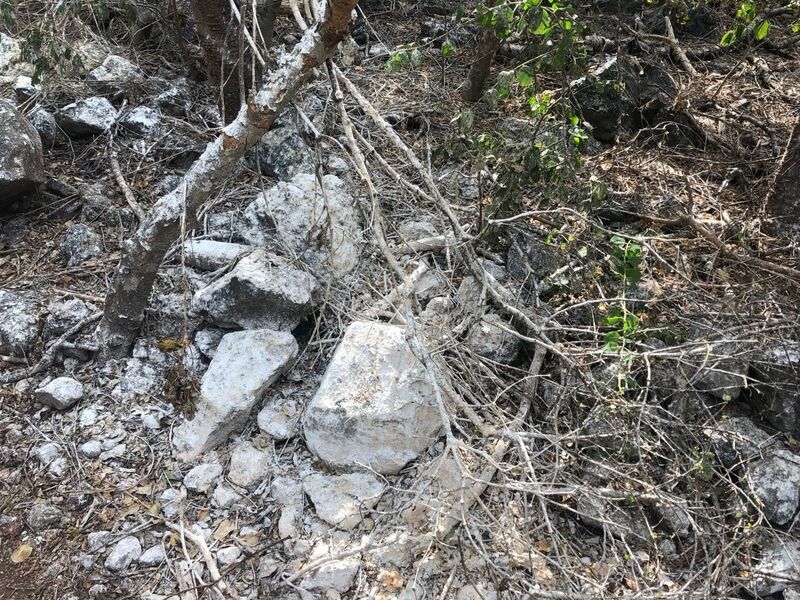 They live under the rocks; you can see this iguana condo's tell-tale tail marks outside the door, and we found one of the residents peering at us out the back. It's hard to convey the sheer volume of birds. In the trees, in the sky, fishing in the water. I love the videos for their ability to convey the density of the bird sounds, but I confess that the odd little squeal when I finally got a clear shot of this little bird is human, and me. 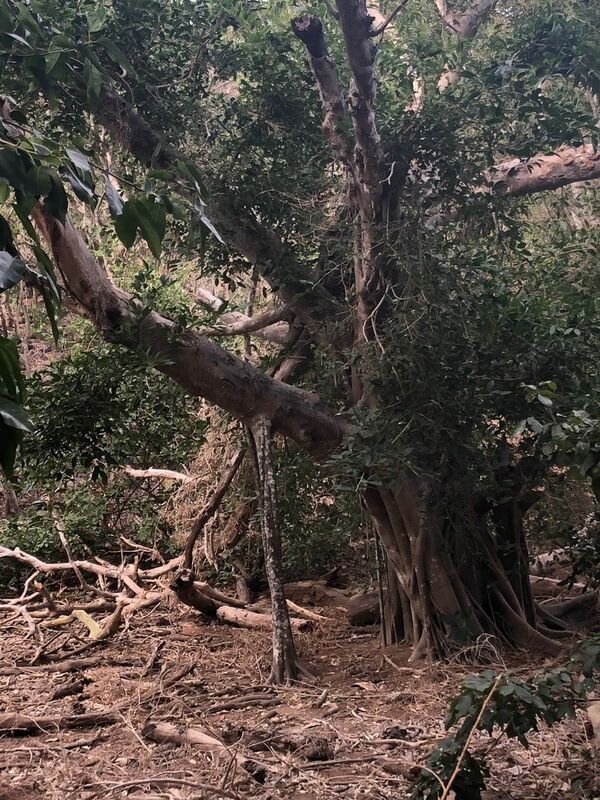 Trees are such a comfort after being at sea, and OH, a banyan! One of my favorites. 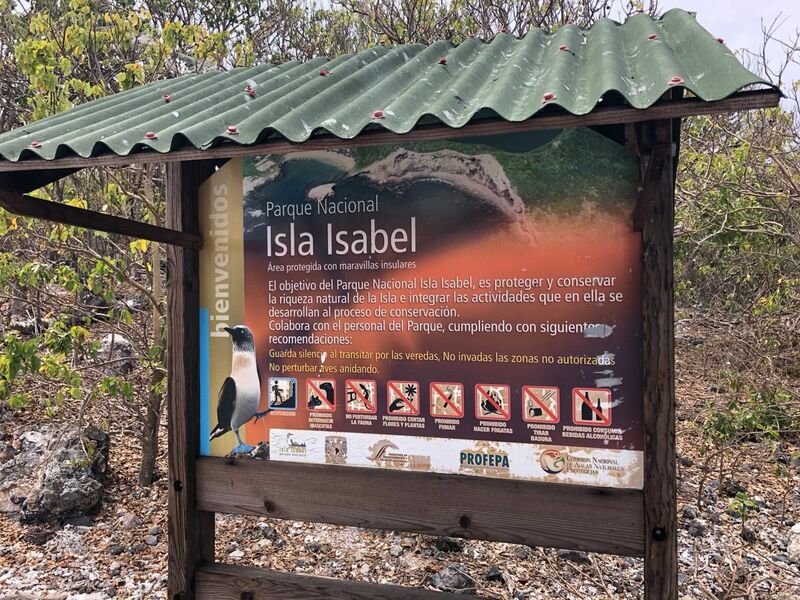 We were blessed with a good spell of clear weather and spent 5 days and 4 nights here at Isla Isabel. Stay tuned for my next post, about our exploration of the waters and the much-closer-return of that mama humpback and her baby! The word of mouth on Isabel is crazy! 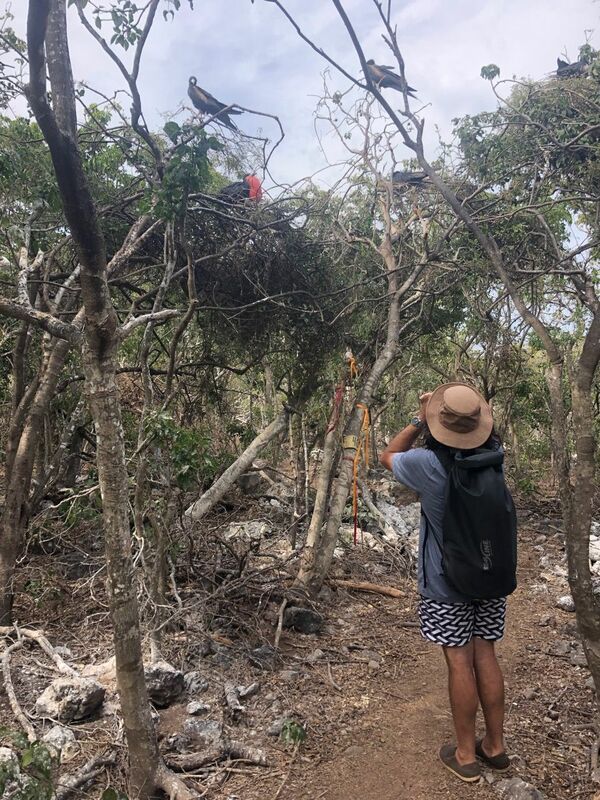 We talked to people who went and stayed for days and said YOU HAVE TO GO, people who couldn't get anchored and said not to bother, people who couldn't figure out the hiking trails and wandered the island and couldn't find the boobies. What follows is my own experience. Do good research and make your own decision. The south anchorage is where you need to land your dinghy to hike, but it's much rollier than the east. In the east anchorage, it appears that there is sand in places, but it's a thin layer over rock; best to assume you're always anchoring in rock there. We used a trip line with a float; almost everyone did and we were glad for it; it made fitting closely feel safer. We had as many as six boats in the east anchorage, one a huge catamaran and one a huge trimaran. We didn't need it to retrieve the anchor, but the option was good to know we had. Diving your anchor is strongly recommended, great gratitude to Dave on Arctos for doing so for us! We'll be taking the free diving classes you recommended, for sure. 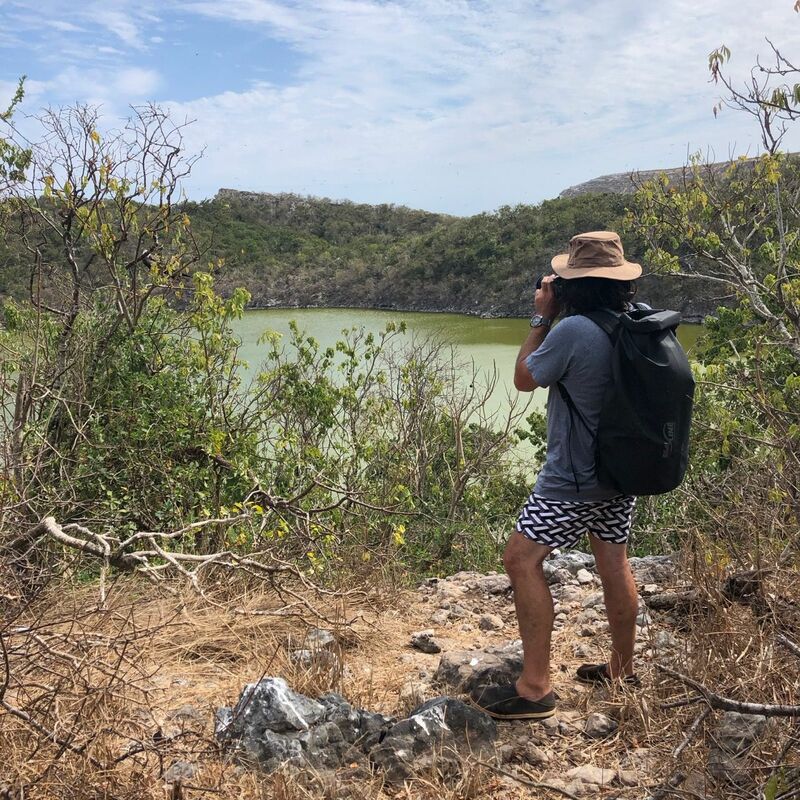 The hike that takes you past the crater lake and to Las Moñas starts BEHIND the fishing shacks. You have to walk between them. I know, it feels rude; everyone tries going around, but the head of the trail is not at the end, it's behind the middle of the row. In 2019, there was a building with the number 13 spray-painted on it, and some flat concrete on the ground between it and the building next door. I decided that might be a path, and I walked through. The fishermen did not volunteer aid, but they were friendly when we where, smiling warmly. The crater lake path is marked with orange plastic ties wrapped around trees, and goes uphill quickly from behind the shacks. Super clear once you are on it; easy to follow. At the lake, the Las Moñas trail starts down low by the shore of the lake if you want to get onto it, and it is marked by blue ties. The boobies are up on the hill with the tower, a brief, steep hike off to the left after you land your dinghy, and they are on the beach facing Las Moñas if you take the east trail. The frigates are all over.